Just When I Thought I Was finished Decorating. I thought my Christmas decorating was finished until I made a trip to Michaels. Their 70% off all Christmas items lured me in. along with free trimmings from Home Depot. New ornaments were added to the tree…. be able to enjoy them in the new year. from getting too tall? We will see if this really works. Thanks for visiting and I hope to see you Wednesday evening at the Open House party. French Country Love has 30% of the entire store through December. 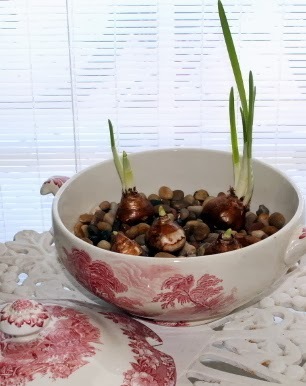 If you want the paperwhites to bloom for Christmas, either turn up the heat in the room you currently have them in or, if that's not feasible, put them in a warmer room. You sound like me. Seems I'm always tweaking things all the way to Christmas day! You've found some great new things. You can't beat those Christmas sales. You did ok at Michaels! I like the arrangement you made with the bucket. The new ornaments add some nice wow to your tree. I went in there the first day of the 70% off and it looked like the displays were stripped bare. They had condensed everything to a few areas. I got some poinsettias to put in a pot and I spent less than $3.00! 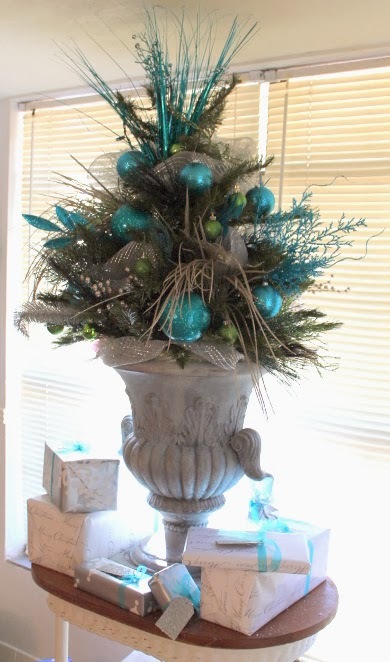 Sherry I love the way you style your home for Christmas. And how did I miss that Walmart olive bucket?! What a deal. I have to get one. The shade of aqua bulbs on your little tree was on my mind this year but I never had a chance to collect any. Maybe next year when we're down by the beach. Wishing you a beautiful Christmas season. Great arrangements! I hit Michael's yesterday and found the 70% sale, too, but it was really picked over. I did get a couple of things, though..yay. I'm still decorating,too..just finished a tablescape in the kitchen. I'll see you at the party. Thanks for hosting. Hi Sherry, I have a surprise for you over at my blog! Also wanted to ask if you would like to host a giveaway for me sometime soon? Of course you probably can guess, but I LOVE the paper whites planted in the red transferware tureen / casserole. You'll have to show us pics once they bloom! We just got our tree up last night and haven't put a single ornament on yet. I love paperwhites! I set mine up to bloom early. They're almost done. My amaryllis are blooming now. I didn't know about the rubbing alcohol. I put my bulbs in tall vases just for the height issue. Thanks for the tip. I don't know if it was the late Thanksgiving or what, but I just can't seem to get done! I prefer that my paperwhites bloom after Christmas. There is so much going on at Christmas that it's nice to have something to look forward to afterwards. Merry Christmas. I'd love to have you link to Seasonal Sundays. I won't be able to resist that too, glad there's no MIchaels close by! Love all the updates! You have got to love 70% off. I love the branches. 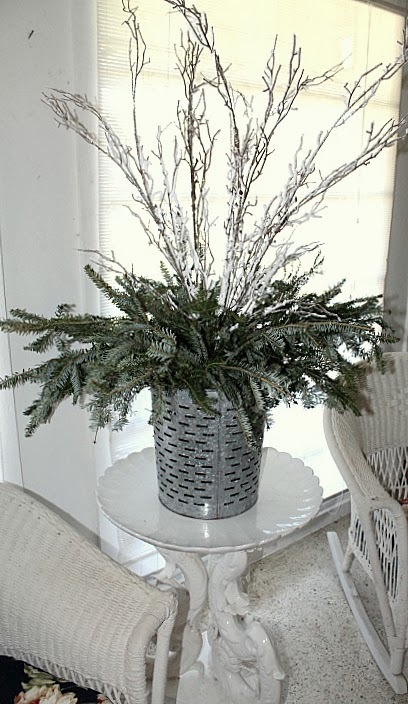 As far as decorating for Christmas, it seems like you are never done…I find myself tweaking things right up till Christmas Eve…love your tree!! !